"pedal assist" 200 Watt hub motor running at 36 Volts makes the trike feel lighter than a bike! Best for flatter terrain due to the less powerfull motor. hub motor kits for bikes & trikes. 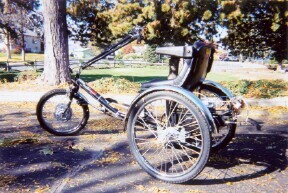 Motor system on demo-trike above is the "Ele-bike" brand as shown on the left. Battery box is a grey plastic that fits under the black (not white) basket. 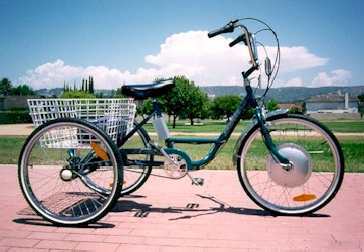 We also have demo models of heavy duty e-trikes we no longer import. SOLD Great prices on these discontinued heavy duty demonstration e-trikes. Were $1500 (pedal version) and $2000 (non-pedal version). Buy them now for $750 and $1000...half price! This used Worksman PAV3CB, with Heinzmann 36V motor, is offered at a great price of $1500, (original price of $2200). Linda's father passed on shortly after he bought it, so it's in excellent condition. Government subsidies and special prices? You've got them now...so what are you waiting for?? 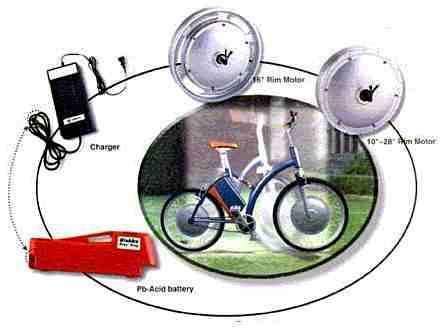 -SUPER SPECIALS for Charger bike orders placed before July 17th. ORDER ANY MOTOR KIT DURING THIS TIME AND GET $50 OFF THE KIT, AND 30% OFF THE BATTERIES.